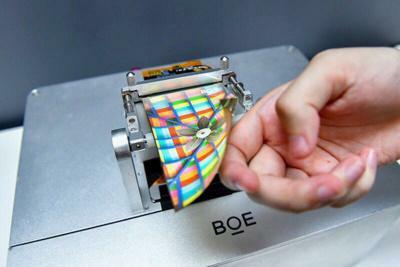 Last week BOE Display held an official ceremony during which it demonstrated its first batch of flexible OLED panels made at its new B7 6-Gen OLED fab in Chengdu. China Daily posted the video you see below showing the panels on display. At the video you can see a foldable AMOLED prototype, a flexible display in an edge-type design, a design that seems similar to the one used in Apple's iPhone X and finally several curved OLED prototypes. The first commercial flexible OLED panels produced by BOE in Chengdu are 5.5" in size with a resolution of 1440x2560 (QHD) - these are smartphone panels that will be adopted in an edge-type configuration. BOE's B7 fab is the company's first flexible AMOLED line. The full capacity is 48,000 substrates per month, but this will only be achieved in the first half of 2019. The total cost of the B7 fab is estimated at 46.5 billion Yuan (almost $7 billion USD). In addition to this fab in Chengdu, in October 2016 BOE announced another 6-Gen OLED fab, in Mianyang. The Miangyang fab will have a similar capacity (45,000 sheets per month) and will enter production in 2019. Total investment in the Miangyang fab is estimated at 46.5 billion yuan as well.